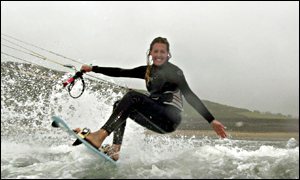 Kite Lessons, Kite Buggy lessons, Kite Boarding lessons, Stunt Kite lessons, basic kite instruction. This online kite flying guide is designed to teach you all the basics of the exciting sport of extreme kite flying. The beginner lessons are prepared for kite flyers who are new to this enjoyable activity. They cover the basics about kite safety, wind, kite design and kite lines. The advanced lessons are designed to give helpful hints and skills to a kite flyer who is looking to improve their current technique or to advance into dual line or quad line stunt kites or power kites. The lessons and information contained in this online manual are the opinions and suggestions of kite flyers who have freely donated their time and effort into creating this manual. We try to be as open minded as possible and to give the best information we can to help people learn more about this exciting sport and to make kite flying an enjoyable event for everyone. 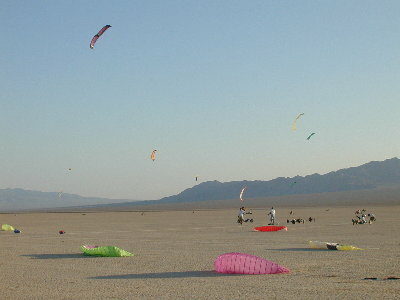 Many people who fly kites, wether they are power kites, stunt kites, indoor kites, single line, dual line or quad line kites eventually develop their own skills and techniques that could vary from the information given in this manual. We acknowledge that everyone is different and appreciate the fact that everyone has their own opinion and ways to fly. Our online manual is not here to tell anyone that the way they fly is wrong! This online manual is only here to help you if you need it or want it. We have put together what "we" feel is the easiest and most informative way to help someone go from the kite store to the air as quick as possible. We love this sport and hope that your first experience flying will be the best it can be. This online manual is broken down into multiple courses that will teach you the basics of kite flying. For beginners, we suggest starting with Course 101 - Kite Flying Safety and then continue through the rest of the courses in sequence. Kite Flying Safety - Kite flying etiquette. The importance of kite safety can never be stressed enough. If you want to fly, do it safe by following these simple and courteous guidelines. This course is recommended for anyone who flies kites. This course will teach you the basics of the "Wind Window" and the effect wind power and wind speed have on different types of flying. Basic Kite Designs and Differences. This course will teach you the basics of kite design including differences between single line, 2 line, 3 line, 4 line kites, stunt kites, power kites, inflatables and ram-air kites. How different line will affect the performance and power of your kite. How to check your line sets for line stretch. How to tie or re-tie your line sets. Hints on setting up your line sets for easy adjusting. Adjusting your line for different kite performance. What kite should I purchase for my first kite? Do I need different sizes of kites? What brand of kite is the best? What style of kite is the best? How many kites should I buy? 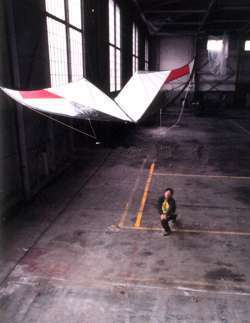 flying an Indoor Vapor Dual Line Stunt Kite. Staking your kite for setup and parking. Attaching line sets to your kite and handles. Kite harnesses - different types and function. Launching and landing your kite. Launching a single line kite. Launching a dual line kite. Launching a Quad line kite. Forward flight and reverse flight. Flying your kite in and out of the power window. The effects of bridle adjustments. How to adjust your bridles. Keeping your lines from getting tangled. Different ways to wind up your lines. Things to note before putting your kite into the bag. How to put away a Peter Lynn C-Quad. 35 minutes south of Las Vegas Nevada. There are tons of tutorials online that show the amazing things that dual line stunt kites are capable of and how you can make them fly the way the pros do. Many of these tutorials are done by professionals and are much more comprehensive than what we would be able to put together for you. Instead of having our own page by page information section on freestyle stunt kite tricking, we instead opted for supplying links to other webpages that are already available and would be much more helpful for you than our own. Most of these pages include other links to step by step videos and walk through tutorials that will have you tricking like the pros in no time. Each link is set up to open up in its own browser window so you can always come back here to view others. Don't forget to add this page into your favorites for easy reference. is a name that has been "flying" around professional kite competitions for many years, and is one of the best of the best when it comes to jaw dropping stunts. Andy has put together some online tutorials that will walk you through the basics of many of the tricks that are available today. Working closely with Tim Benson, he has helped inspire some of the most advanced kites on the market. This is probably the closest you will ever get to having a professional kite flyer give you personalized side by side instructions without having to pay for them. His online instructions are worth studying by the beginner who is looking to start stunt kite freestyling as well as the advanced pilot who is looking to sharpen up their current bag of tricks. None of these lessons help me, what else can I do? You can contact customer support 24 hours a day, 7 days a week. Simply E-mail us a description of the information you are looking for and we will get people on it right away. You can contact us by selecting the "Contact" navigation link on the home page or simply clicking here for customer support and then selecting the E-mail link. FREE SHIPPING on all orders over $199.00!!! Click here for more details.